Marketing 101 – Stand out or get out! 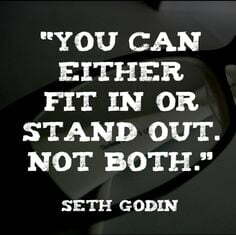 Seth Godin, the marketing guru whom I avidly follow, is quoted to have said: “You can either Fit In or Stand Out. Not both”. I think he couldn’t be more correct. It isn’t easy to re-invent your strategy, marketing, branding and messages in order to stand out; and I know this from first hand experience. 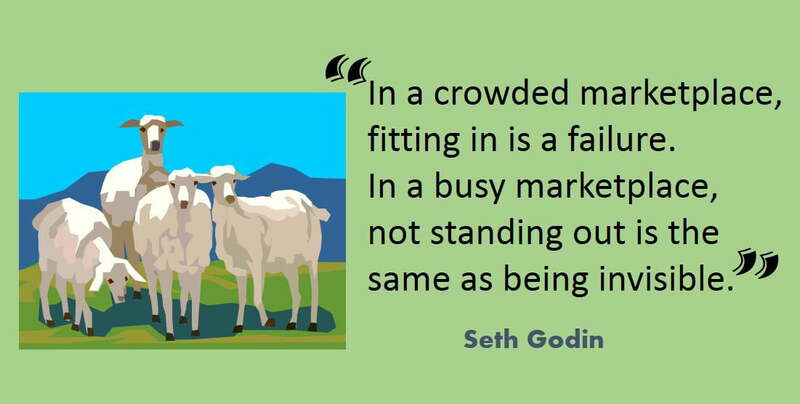 But if you follow the herd and do what most/all of your competitors are doing, you may be fitting in, but you are practically invisible. You have to dare to do the thing that may seem counter intuitive at first and you have to be prepared to go all the way. If you are not – then you might as well quit. So how do you Stand Out in your marketing? You can stand out from the crowd in many ways in your marketing. They can be little things that set you apart, or they can be huge elements of your branding that really cause people to pause and wonder what you were thinking. Imagine a serious hardware company (boring, right?) that uses a logo resembling a red flower or yin-yang symbol and perhaps an animal; a software troubleshooting start-up helping programmers get rid of bugs…branding itself with an animated colorful cookie monster; or a dental hygiene consumer product with a logo that is anything but the usual and anticipated red and blue…These are real life examples of companies that took their mainstream rather boring niche and gave it a splash of color and flare with a very nontraditional logo. This is where you can think outside the proverbial box. Most websites look the same these days. I’m not saying yours should look totally different but you can think of little things such as putting the menu on the side rather than on top (yes, it’s going to look like your visitor was taken back in time to the 1990’s… that’s kind of the point), or use images, comics and animation to guide your visitor through sections… anything goes as long as you do not compromise on User Interface and Experience (and it has to be adjusted to mobile display). Yes, you need to have an “about” page and probably list your services and present your team, but no one said you have to do it in a boring and anticipated way! If you have a flare for words, toy with them. If not – get yourself a skilled copywriter and tell him or her to “go wild”. You see it’s not so much about what you do (which, most chances are, is not new or really innovative no matter how much you’d like to think it is), but about the story you tell. Your content should be a new world created especially for and around you and your brand. A world with its own language, traditions, maps and hidden treasures. Think of your marketing as storytelling. #Marketing 101: Think of your marketing as storytelling. Many people think that your marketing message is reflected in your content or your slogan. However, your message is not your content and this is why I’ve set this section apart. Your message is what you stand for – your personal, professional and business values. To craft your message you have to understand and answer (to yourself first) the question: “Why did I embark on the journey of founding _____ / developing _____/creating ______/importing _____ “[you can cross off or complete as you see fit]. The answer may be – because you saw profit in there and wanted to make money, which is perfectly OK. The answer may also be because you love what you do and wanted to share your passion with the world. Or maybe you wanted to save lives or help old people cross the road. Whatever the reason – this is the core of your message. The message you convey to your customers is who you are, why you do what you do and how it will benefit them. Most businesses just go for an empty, buzz words filled message, or “vision”. Don’t fall into that trap. Do things differently! The most neglected part of any business – the community (or “tribe” as Seth Godin calls is). Most businesses set out looking for customers for their product or service. Very few do it the other way around – looking for products or services for their customers. In other words – if you push your products to people, yes they will buy them and you will have customers but you will never have a community or a tribe to lead and inspire and you will never have a group of advocates that can push you forward and onward. If you dare to think differently and find how you can harness your strengths, skill and knowledge in order to give people what they really need or want, you will become the leader of a tribe and that already sets you apart, making you stand out.